Our neighbours The Chester Cathedral Bellringers have been sipping some of our Dong Ding tea, compliments of Jenier Teas, and they got inspired. So inspired that they've created a 'method' (a sequence of bells being rung) in its honour! It's the first ever 'method' about tea itself. Come and hear 'The Dong Ding Surprise Method' being rung for the first time at 10.30, Saturday 18th April and you'll be witnessing a little bit of bellringing and tea history... and please come and ring one of our slightly smaller bells for a donation to two local charities and enjoy a sample of our signature carrot cake and dong ding tea for free as a thank you! See you at Bell Tower House, 10 to 12 this Saturday, 18th April. 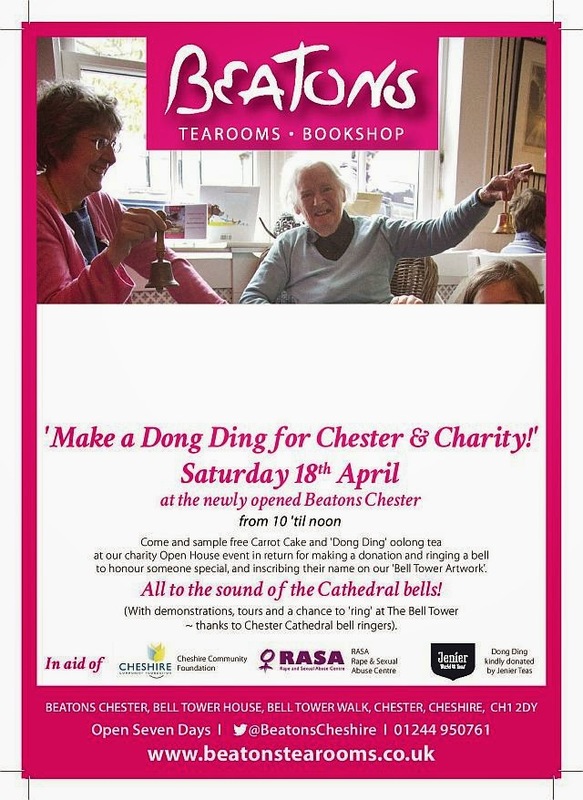 #Chester: Cathedral Bells Make a Dong Ding! Beatons Chester is Open First Pictures!